Blackfly, a camping dinghy for sail and oar. Herring Skiff, free plans for an outboard skiff. Here are links to all the free boat plans I could find on the internet. Also be sure to check out my One Sheet Boat Links as most of them are free plans. If you want some model boat plans instead, see the model boat page! First of all, the pdracer has been many peoples introduction to boatbuilding, easy and cheap, with many different free plans available. Of course if I'm missing something, or in case of dead links, don't hesitate to contact me! Need to sort through this site, which has a bunch of interesting looking designs. Noname, Stitch and glue design with extra stability. Double Trouble, Stitch and glue two person kayak. Laker kayak ***** , also here on duckworks. Igdlorssuit * , Freeship file. Goodnow * , Freeship file. PakYak **** , Free plans for a skin on frame kayak that can be taken apart to be transported. PodYak * , Here's a building log of one. King Canvasback *** , A skin on frame kayak. Plyak *** , small plywood kayak. folding kayak *** , also as an msword document. Dougs boat page, 2 plans , The Qivitoq and the #11 design. Huntington Harbor , Super easy to build using ordinary lumber and gorilla glue. Building video. Some Italian kayak plans, in google translator. Retrieval, skin on frame version , In translator. Michela second , Skin on frame kayak. scoutyak , Look way down the bottom of the pdf file. Working with epoxy cleanly and efficiently, e-book by Russell Brown. Katie Beardie, decked sailing canoe, stitch and glue. Build thread. Lazy weekend canoe , Ply, easy to build. Malecite St John River Canoe* , Strip built. Jem DK-Touring canoe ***** , stitch and glue, great plans! A canoe you can build **** , Simple tortured ply, clear instructions. Here is a page with some examples. Wacky Lassie **** , simple to build. Pirogue *** , Lots of nice old plans on this site (no more boats though). Notus * , This is really a FreeShip tutorial but you basically end up with plans. Sailing canoe! Zip file also includes the malecite canoe lines. pintail *** , ply, duckboat, (like a wide kayak). redwood canoe *** , Strip planked. little chief *** , canvas covered, old plans. glide easy *** , Glass over tortured ply, old plans. blue bill *** , canvas covered, old plans, canoe/kayak hybrid. 12' pirogue canoe , send an email to receive the full plans. the classic cajun pirogue ** , taped seams ply. These are the full plans, except for measurements! Very good instructions though. Cinderella ** , Stitch and glue, multichine canoe. Bolger Peero *** , Plans for a sailing pirogue. How to build a canvas covered canoe , Scanned pages of a very old book. Paper canoe , Why not!? Robin, Skin on frame pram with ply bottom. Dinky Dink, Small stitch and glue dinghy. Pippie 8 , “tack and tape” construction, 3 sheets of ply. Trifecta , Ply, “Tape and glue”. 3 Modular designs in one; tadpole, guppy and tripod. Pod2 and Big Pod , Ply, 2 more modular designs. Portuguese style dinghy ***** , Tape and glue, 1.5 sheet skiff. Minu Auray Punt ** , 1.5 sheet punt. Mini Ekstock ** , 1.5 sheet punt. Dinghy 57 ** , Stitch and glue version of old boat. Forest and stream skiff *** , Stitch and glue skiff design. apple pie *** , Stitch and glue pram, 2.1m (7'). Check out this finished example!. And a Youtube Video, there's a few more on there. micro folding dinghy , Plywood/canvas folding pram. Dinghbat * , Stitch and glue, Coordinates for a heavy displacement pram. Light dinghy , Ply pram dinghy. Ensign's gig , Ply, small skiff. Plywood lath coracle , A canvas covered circular boat thing. Build a 3 dollar scow** , Planked scow, very old instructions (1876). Jolly Roger **** , Chine log, old magazine plan. junior *** , chine log, multi-purpose dinghy. handy andy **** , Ply/canvas folding dinghy, old magazine plans. two rowing boats , The first: 11' ply rowboat(***), the second: 12' ply rowboat (**). Jolly Roger **** , Ply or planked. little 8 foot skiff. Solo Wood MGM, French plans for a stitch and glue rowing skiff. Julie Skiff **** , Stitch and glue, the intheboatshed.net flat-bottomed 15ft 6in skiff. The first one has been built! Ella Skiff ** , Stitch and glue, smaller 12ft version of the Julie Skiff. ozark johnboat , Large scow type boat, planked construction. Build a 5 dollar skiff. , Old instrutions. Planked. Build a 9 foot Sharpie , Old instructions, planked. oarmouse , Stitch and glue, a fast 14ft one-man rower. cruising mouse , Stitch and glue, stretched mouse boat. Build a 5 dollar skiff , Planked skiff, very old instructions (1876). The big images have dissappeared but if you contact me I can send them to you. white duck , Planked, rowing skiff. Wooden fishing boat designs * , Some planked boat drawings. Duckskiff ***** , Ply, row or motor skiff, designed with duckhunting in mind. anyones boat *** , Planked, skiff designed for super easy building (before the days of plywood . Elf * , Stitch and glue, v-bottom skiff. Thames Rowing Skiff ** , Clinker? built, 21 foot traditional Thames rowing skiff. Thames Racing Punt ** , Traditional 30 foot Thames racing punt. Flat bottomed swamp boats *** , Hannu's Boatyard, ply/epoxy. S-230 "Perkoz" , Stitch and glue skiff, polish web page. Very nice plans and even building instructions! Tern , 24' glued lapstrake exploration ketch. Rime **** , Chine log, ultra-simple scow hull. Wonderful instructions! little breton , Ply stitch and glue/lapstrake, little pram. graefin 10 , Stitch and glue pram. optimist plans , Ah, the famous optmist pram! Original optimist plans , In a magazine from that time. Scroll down the page. How to construct a simple boat , A scow made in the traditional way, no plywood. Great instructable. Scow ***** , Stitch and glue scow, excellent instructions! Great boat with lots of safety flotation. 4.2m skiff **** , Stitch and glue, the name says it all. sea skiff , The first (sea skiff) is a multi-purpose ply skiff, the second a strip-built motorboat. Electric shock ** , Chine log skiff. 4.0m dayboat **** , Stitch and glue, dayboat, lugsail. Blondie **** , A stitch and glue small sailing boat, one of my favourites! summer breeze ***** , A small skiff made from 2 sheets of plywood. patty *** , Lapstrake, small skiff, old magazine plans. Blackfly ** , Ply lapstrake, very very pretty design. A camping dinghy for sail and oar. Right here on this site! Also check out another great Blackfly dinghy. bingo – , Ply multi-purpose dinghy, old plans. frosty , Ply, 9 foot dinghy. Light Trow , Stitch and glue/chine log hybrid Very nice daysailer. Also see a finished example! 10 foot clinker built double ended skiff. Shannon , Ply lapstrake, yawl rig. 17.5ft. DH Boat **** , Chine log, 2 sheet double ended boat design. Eek A Mouse*** , An alternative to the optimist dingy. Sandy , A 18.5' double ended sharpie, old plans. Funfish Wooden sunfish clone. Need to join the Yahoo group to get access to these. Segeljollen MII Great looking boat from Sweden. Northbride Junior Ply, alternative to the optimist. Simple self-bailing scow hull designed by Frank Bethwaite in the 1960's. Like a small version of the NZ Moth. International 110 , Double ended race boat with trapeze and bulb keel. Minisail , Ply, very cool boat with sliding seat. Plans aren't completely complete, in particular no rigging information. PDRacer Plans , Ply, 3 different professional quality plans. By Ken Simpson, Jim Michalak and John Welsford! Ella skiff - sailing version **** , Stitch and glue, 12 foot sailing flattie. Rodent , Ply, “An easy, inexpensive sailboat for a young person”. Stella , Really small “sit in” sailboat with ballasted keel.. Strip or clinker. See here. Bridget , Small sailboat that uses optimist rig and foils. See here. Strip or ply. Fiona, Coreen, Sonia, Brenda, Rhiannon, Connie, Grace, Shannon. , Strip plank, clinker and ply designs, each available in various sizes. Eddy Cat , 13' sailboat, old, not much info. sharpie * , A 6m sharpie, old racing design, still sailed today. Australian Lightweight Sharpie Plans , This is the southern hemisphere version of the above, light and fast! E=MCX , Ply dinghy, designed for the Italian “10 pidi” class. In Italian, but here is the page translated. NZ Moth , Ply scow racing dinghy. 1940's mkII moth design, and Cole Super Moth ** , Ply moths. Scow type hull. Australian Moth , Wanna build a realy fast boat? You found a couple then! Flashheart moth ** , Hydrofoils… So you wanna go really fast!! Gidge Gandy's Groovin Garvey (sandspur) , Planked scow. 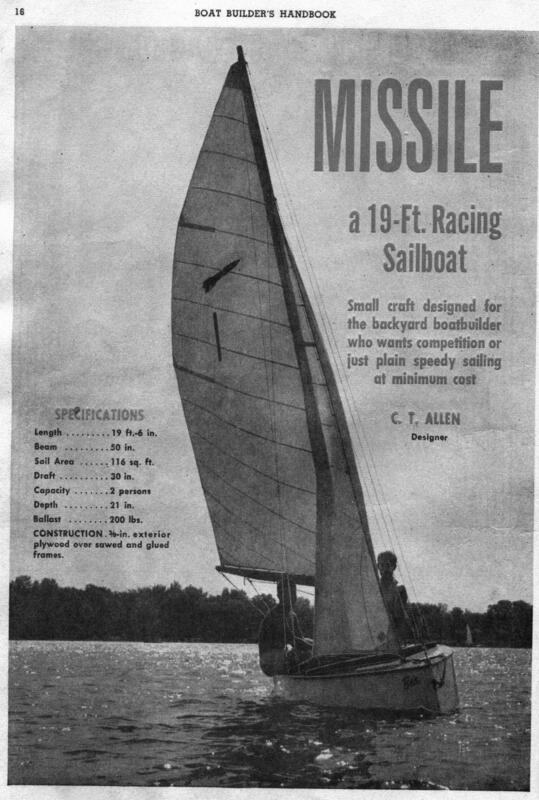 missile **** , Ply double ender, 19 foot Racer. Old plans. Flying mouse , Stitch and glue, a sailing version of the popular mouse boat. expedition mouse [.zip file, 394 kb] , Stitch and glue, stretched flying mouse. hot rat , Chine log, scow-type hull. Designed to give sailors a fun ride, yet very simple to build. the edge , Stitch and glue, scow type hull with slight v-bottom. Sprit sail. Wildcat , Stitch and glue, a fast sailing boat that uses a windsurf sail. St Michaels sailing scow ** , An old racing scow, also see this page for more info. conga *** , Chine log, old, a 12foot sailing knockabout. crescent , Ply, a very large day-sailer. tramp *** , ply dinghy, 15ft. mini-cup ***** , nice plans for a board-boat, like the sunfish. lots of info on the internet. Video, Building log video, very entertaining. 3.8m dinghy **** , Stitch and glue dinghy, 3.8m. 4.5m dinghy **** , Stitch and glue sailing dinghy. Sztrandusia **** , Ply or stitch and glue. Cruising and sport versions (with trapeze and spinnaker). Site in Polish. snorky ** , Ply, 14foot sailing scow. tiny bear **** , Ply, old magazine plan. A 10foot junior moth class sailing scow. dart **** , Ply, old magazine plan. fast sailing design. tabu **** , Ply, fast sailing scow with trapeze, old plans. falcon **** , Ply, old plan, 14 foot dinghy. Sea Flea , Ply, old magazine plan, board boat. Jamaican , Ply, old magazine plan, board boat. manu , Ply, 20 foot racing scow with hiking board. Old plans. tern *** , Ply, sailing scow. Old plans. zephyr **** , Ply, 14 foot international dinghy class. old plans. Nethercott International Canoe plans , Send a self-addressed envelope and get the plans, for a very fast boat! Also building tips etc. Triciclo 2.0 Another 10 foot class trimaran. Mister Bean, another italian 10 foot class trimaran. Uffa 10, 10 foot trimaran. How to Build a Timber Outrigger Canoe , Wood/ply. Produced by the FAO. Tarja , Strip or lapstrake trimaran. Triciclo 2.0 , 10' ply trimaran, in italian. DS12, an F12 catamaran design **** , Also see this gallery of one being built and sailed. Tornado Catamaran , Thats right, free plans for a tortured ply olympic class catamaran! P5 Proa **** , Stitch and glue proa. pontoon boat **** , Stitch and glue pontoon boat. Pati A Vela , Cool catamaran that is sailed rudderless. sea mite , Ply, a kind of almost-catamaran. 12ft. Cats Paw **** , Ply catamaran. Simple hull design. hobby kat **** , Ply catamaran. Based on the hobie cat. 20 foot trimaran , Ply trimaran. King Kat , Ply, simple to build catamaran with lateen rig. How To Build Catamarans , Very old article, 1878. Spray 700 , Incomplete, 7m radius ply with steel keel. Cruiser. Analytic , 10m steel yacht. Pirate , 17 foot cabin sharpie, old plans. Polliwog , 18 foot sloop, old plans. Dorothy , 24 foot motorsailor, old plans. splinter *** , A 'sailing toothpick', kind of like a sailing canoe. Has springboards instead of a trapeze and a ballasted keel. Old plans. Sztrandek , A 4.95m pocket cruiser, made for cruising along the coast. Sleeps up to 4! Click on 'polish version' and scroll down the page for photos, click them for building photos. Also see this page of tips. Sztrandek long voyage , Based on Sztrandek, designed for 2 people planning long voyages. Sztrandusia - sails 500 **** , Ply, 5m ballasted racer (“Zagle 500 class”) Nice big Gennaker! Site in Polish. Sztranduś , A small 4 meter pocket yacht. The 'little brother' of Sztrandek. There is a picture of one built here. And Jim Michalak's website (15October 2012) has another two pics!! pilgrim 590 , Ply, a nice trailer yacht. kavalier 800 , Bigger version of the above. S 750 , The largest in this family of cruisers at 7.5m. petrel ** , Ply, 16 foot trailer yacht. Old plans. starlite ** , Ply, 27 foot motorsailor. Old plans. Here is more info. Blue Moon , Ply, 16ft cabin cruiser, old plans. gypsy ** , Ply, “proven motorailer design”. 24 foot. Old plans. egoist 5.5m coastal cruiser , Ply, coastal cruiser plans, the site is a complete mess, here's a link to the plans. yago 31 and 36 , Steel cruising boats. Kral 630 , Plans for a sportboat, in russian. Muskoka Sea Flea , Fast little hydroplans and stuff. Herring Skiff , A 12 foot slightly v'd stitch and glue skiff. Fishing boat designs **** , 2 V-bottom boats of planked and plywood construction, by the FAO. Brockway Skiff ***** , Ply skiff, simple rugged design. Very good instructions! Also here. Surfboards , Ply, old plans, includes a sailing surfboard! bicycle boat *** , Ply, Bicycle powered catamaran. kick-katamaran ** , Ply, Old plans. Kick powered small scow hulled catamaran. Can also sail. paddle pusher *** , Ply, very small kids boat. Pogo , A little paddlewheeler. Cootie Craft , A little scow, ply and planks. Jiffy Skiff , An ugly boxy boat. Dutch Friese Schouw Dutch Regenboog Two plans from the friese scheepvaart museum. There's probably more if you search the collection. HANDBOOK OF ARTISANAL BOATBUILDING , Produced by the FAO. The Boy Mechanic Vol. 1 700 Things for Boys to Do , Canoe, sailing canoe, cruising catamaran, paddle boat, punt, bicycle catamaran. Not detailed. Boy Mechanic, volume 2. 1000 things for a boy to do. , Ice boat catamaran, paddle wheel boat, double ender skiff. Booth Bay dory , Ply on frame, small dory. row-sail dory *** , Also availible as pdf files at this site. south haven dory , also here on duckworks. 2SD , Stitch and Glue, 2 sheet dory design. Hannu's Boatyard. 3SD , Ply, 2 3 sheet dory designs (5.2 and 5.4m), Hannu's Boatyard.